VANCOUVER — With star striker Kei Kamara sidelined by an injury, the Vancouver Whitecaps needed someone to step forward Friday night against Los Angeles Football Club. 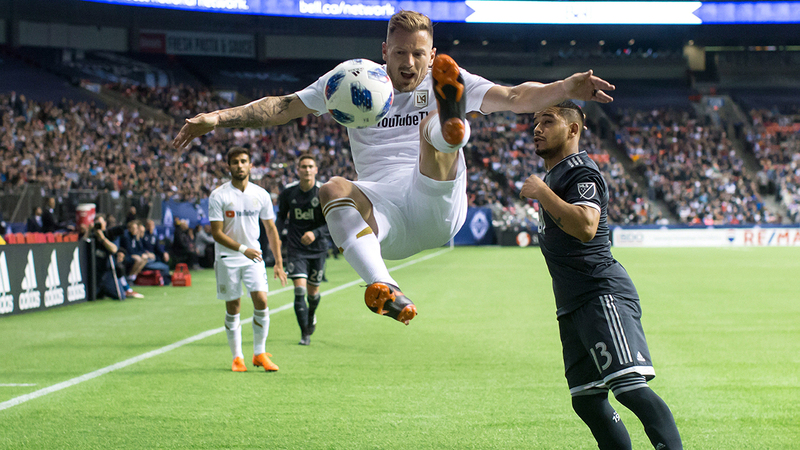 The Whitecaps gave up two second-half goals and lost 2-0 loss to LAFC. Not only did the loss snap Vancouver’s 11-game Major League Soccer home unbeaten streak, it also was the first time in over a year the Whitecaps lost back-to-back games. "It’s not one player that you can say didn’t step up, it’s a team," said veteran midfielder Russell Teibert. "I don’t think the whole team played well today. "When you have a team that doesn’t play well you’re not going to win games. They scored more goals than us, they had more quality than us, they had more possession than us. They were better than us." Carlos Vela and Diego Rossi scored for the expansion LAFC (3-2-0). Costa Rican forward Marco Urena assisted on both goals as Los Angeles ended a two-game losing streak. Kamara injured his groin in training Thursday. Head coach Carl Robinson said the 33-year-old from Sierra Leone underwent an MRI Friday but will probably be lost for "a period of time, unfortunately." Kamara was one of the Whitecaps biggest off-season acquisitions when he was obtained in a trade from New England. In 12 MLS seasons, he’s scored 101 goals, including three this year as a Whitecap. Without Kamara in the lineup, the Whitecaps had few scoring chances and lacked finish on the ones they managed. "I could say it (losing Kamara) didn’t affect it," said Robinson. "Clearly I would be lying. I think we huffed and puffed up front." LAFC coach Bob Bradley said Vancouver is a different team without Kamara. "When you play Vancouver, you have to make a special emphasis in terms of set pieces," he said. "When Kamara doesn’t play, that brings them down from that end. With Anthony Blondell still recovering from a concussion, Robinson used Erik Hurtado at striker. "At times during the season we are going to have to ask players to step up," said Robinson. "Today we did but we were beaten by a better team. We have to accept that." There were boos from the crowd of 22,120 at BC Place Stadium when the final whistle blew. It was unclear if the fans were frustrated with the Whitecaps’ performance or the game’s officiating. The Whitecaps (3-3-1) were beaten 2-1 on the road by Real Salt Lake last Saturday in another game where they couldn’t finish. "It’s not ideal but we are going to go through periods this year where you don’t create a number of chances," said Robinson. "We’ve had them in two consecutive games. "We just have to go back to the drawing board, whether it’s a tweak in formation or a tweak in personnel." Vela put LAFC ahead 1-0 in the 59th minute. Left alone in the box, the shifty forward was fed the ball by Urena and launched a rainbow shot that arched into the top right-hand corner of the net. That broke a LAFC scoreless streak of 202 minutes. Rossi took advantage of some poor Whitecaps clearing attempts to score in the 70th minute. Vela and Rossi have four goals each on the season. Bradley liked the way his team rebounded from a 5-0 loss to Atlanta last week. "We had a strong response," he said. "We talked about getting better week to week. "This is a difficult team to play against. Our competitiveness, our concentration, those things were very good today." Harvey received a standing ovation from the crowd near the end of the game. "It took me by surprise," he said. "That meant a lot to me. I’m very grateful to have spent the years here and for the memories that I have." NOTES: There was a minute of silence before the game to honour the victims of the Humboldt Broncos bus crash. … Vancouver midfielder Felipe played in his 200th MLS game.â€¦ The Whitecaps’ last home loss was a 2-1 defeat by Portland on July 23. â€¦The last time the Whitecaps lost two games in a row was last March 11 against San Jose and March 18 against Toronto.